This 7-piece dining set is a prime example of how good design, quality materials, and lasting durability can all come together under one remarkably affordable price tag. This dining set is sure to please even the most discerning of critics, its clean lines and understated design make this table as versatile as it is beautiful. This set can easily seat 6 people with room to spare, the large table easily able to accommodate place settings, glasses, and serving trays. Each chair has 2 built in arm-rests for added comfort as well as both a back and seat cushion made with premium Sunbrella fabric that can fasten onto the chairs frame to ensure they stay put. Built from rust-free aluminum with a durable powder-coated finish this dining set is built to be enjoyed for seasons to come. 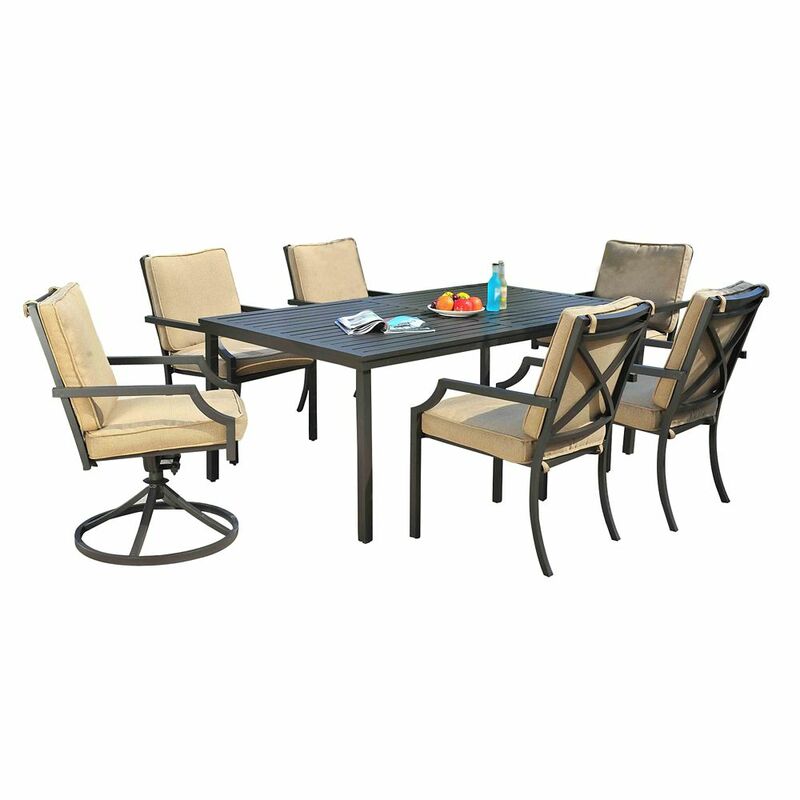 Pine Ridge 7-piece Patio Dining Set This 7-piece dining set is a prime example of how good design, quality materials, and lasting durability can all come together under one remarkably affordable price tag. This dining set is sure to please even the most discerning of critics, its clean lines and understated design make this table as versatile as it is beautiful. This set can easily seat 6 people with room to spare, the large table easily able to accommodate place settings, glasses, and serving trays. Each chair has 2 built in arm-rests for added comfort as well as both a back and seat cushion made with premium Sunbrella fabric that can fasten onto the chairs frame to ensure they stay put. Built from rust-free aluminum with a durable powder-coated finish this dining set is built to be enjoyed for seasons to come.